I’m getting married THIS YEAR. I know, how did that happen?! Apart from being incredibly excited about celebrating my relationship with my soulmate, I’m also ready to buckle down for the next 5 months and continue to work on my body composition. As you’ll know from part 1 of this series, since September I’ve been focusing on weight lifting with a bit of cardio and tracking macros and calories to make sure that I’m fuelling my body correctly and facilitating the fat loss. 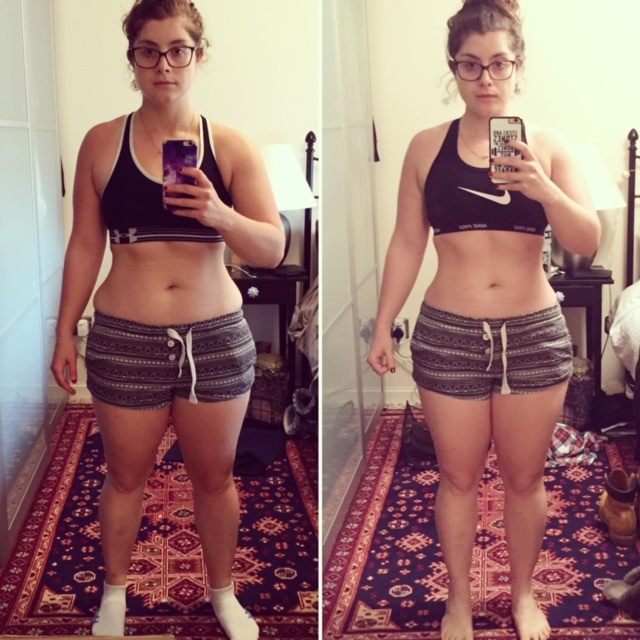 The key thing that’s motivating me are these photos because there’s only about 4lbs difference between these two. I use the scales to keep an eye on things but they don’t give you a clear picture of what’s actually going on within your body. I’d urge you to take photos (you don’t have to plaster them all over Instagram like I do!) each month and use them to track your progress rather than the number on the scale. My training is about to get a bit mixed up as I start training for my first ever half marathon which I’ll be running 6 weeks before the wedding. My weight training will continue although it might drop down to 3 times each week rather than 4. Are you training for a specific date or event? Let me know how you’re getting on! This was so me last year! My wedding was in May 2015 and all my training was focused on that date. I looked great in my wedding dress, I was so happy. But the wedding has come and gone, and I’m still training and losing weight :). I have a couple of half marathons scheduled for this year. Wow, you’re doing fantastic well done! I’m following a plan with an online coach in prep for my wedding at the moment. Hope my results end up as good as yours! Thank you! I love your site too, you’re doing an amazing job!